Learning American Sign Language 2 Edition American Sign Language is a rich and complex language. Recently declared as an official language and recognized by 48 states as a foreign language, more and more high school teachers across the country are teaching American Sign Language as an elective. Learning American Sign Language: Levels I & II – Beginning &Intermediate is designed to prepare teachers to successfullyinteract with American Sign Language (ASL) users. Lessons are structured around language needed for common-life situations, and examples are presented in the form of dialogues coupled with grammar and vocabulary instruction. Information is also included about the culture of deaf people in the United States. Learners will discover that the book: Contains lessons designed around the conversational language needed for common life situations. Illustrates hundreds of sentences and vocabulary with over 2,000 high quality colorized drawings that aid in study and memory. Contains over 100 grammar and cultural notes, 72 exercises, and charts of the American Manual Alphabet (Finger spelling) and ASL number system. Teaches the rules of ASL in a natural order that is predictable and compatible with everyday language of native users of American Sign Language. Incorporates information about the cultural lives of Deaf people in the United States. Is supported by a video demonstrating all the conversations and important structures in the text. Order the Video! Video to Accompany American Sign Language, 2/e Order No. 0-205-27554-0 American Sign Language students will find themselves captivated and entertained by this state-of-the-art Video that presents all 72 dialogues and each key structure from the text in a clear and natural way. Four internationally known Deaf actors animate the dialogues bringing life to the illustrations in the text allowing students to preview and review instructional materials at home to enhance their classroom learning. About the authors: Tom Humphries is Associate Director of the Teacher Education Program and also teaches in the Department of Communication at the University of California, San Diego. He is currently coordinating a program to train teachers of deaf children using a bilingual approach. Prior to this he taught at Gallaudet University in the Department of English for several years and later served as an Associate Dean for the San Diego Community College District where he coordinated the development of an ASL program and an interpreter-training program. He holds a Ph.D. in Cross Cultural Communication and Language Learning. Dr. Humphries is co-author with Carol Padden of Deaf in America: Voices from a Culture and several other books and articles related to ASL and the culture of Deaf people. Carol Padden is a Professor in the Department of Communication at the University of California, San Diego where she teachers courses on language, culture and media. She is a graduate of Georgetown University and received a Ph.D. in Linguistics from the University of California, San Diego. Her recent research includes studies of reading development in young deaf children and she has written extensively about the cultural lives of Deaf people in the United States. She received a John Simon Guggenheim Fellowship, in addition to numerous other awards and grants for her work. In addition to the books she has co-authored with Tom Humphries, she has published several other books and articles on American Sign Language structure. 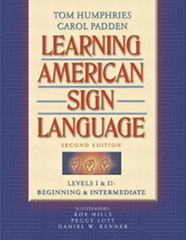 Humphries & Padden (Learning American Sign Language, 2e).